Tooth decay doesn't happen overnight. It's a process that develops over time through repeated exposure to bacteria and acids. Fortunately, tooth decay is treatable. At Smile Solutions by Emmi Dental Associates, we offer a wide range of restorative dentistry treatments to reverse the damage of tooth decay and restore the smile's health and beauty. 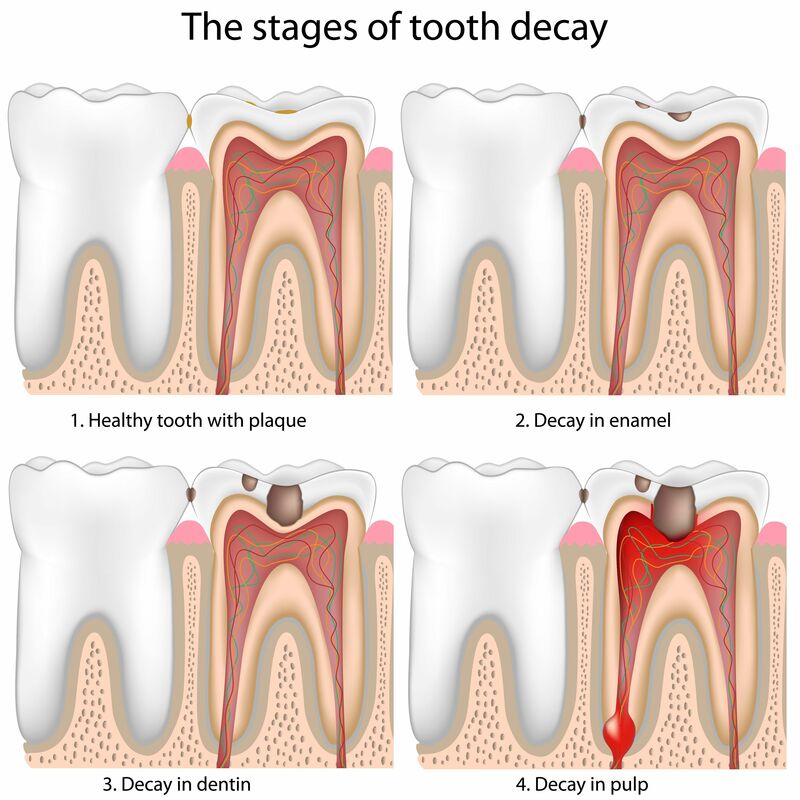 Find out more about the tooth decay as we discuss its stages. If you live in or around Wilmington, DE and would like to know more about tooth decay and your treatment options, we invite you to schedule a consultation with our team of dentists. The first stage of tooth decay is demineralization. During the demineralization process, minerals that strengthen the enamel are leached away from the teeth, causing a white or brown lesion to form on the surface of the tooth. When tooth decay is caught at this stage, steps may be taken to remineralize the enamel and prevent decay from advancing. If demineralization continues without treatment, decay will advance to the next stage, which is enamel erosion. The enamel is the hard outer layer of the teeth that protects the delicate inner structures from infection and decay. As demineralization progresses, it beings to decay the enamel. Enamel decay often creates a visible cavity within the tooth or may be seen with an x-ray. As decay through the enamel progresses, the inner dentin layer will eventually be exposed. Once the dentin is exposed to bacteria and acids, it will begin to decay. When decay reaches the dentin layer of the teeth, the tooth may begin to feel sensitive to hot, cold, sweet, or sour foods. This is because the dentin has microscopic tubules that lead to the inner nerves of the teeth. At this stage, decay must be physically removed from an affected tooth and treated with a dental filling or other dental restoration. As decay progresses through the dentin it will eventually reach the inner chamber of the tooth that houses the pulp tissue, nerves, and blood vessels, which are responsible for nourishing the tooth and regulating sensitivity. When bacteria are allowed to reach these tissues, they will become infected, causing a painful root canal infection. As infection advances, the nerves and pulp tissues begin to break down. This can cause the tooth to die and must be treated with root canal therapy. If a root canal infection is not treated, the infection may spread to the root tip and out into the surrounding bone and tissues, creating a pus-filled pocket, called an abscess. Abscesses are extremely painful and can cause the face to swell on the affected side. Treatment for an abscess should be sought as soon as possible to prevent the further spread of infection and to save the tooth if possible. If you suspect you suffer from tooth decay, we encourage you to schedule a consultation to learn more about your treatment options.